The popularity of Solar Home Heating or Solar Space heating has shown the largest growth in the solar thermal market primarily due to the extreme high efficiencies and higher operating temperatures that are possible with vacuum tubes. Solar Evacuated Tubes perform in low light conditions and temperatures reaching minus 35 degree. Solar Home Heating is popular in Northern USA, Canada and Europe. By integrating solar thermal with an existing heating system such as radiator, in floor heat or forced air heat, a home owner can expect to save up to 50% of their heating bill. Because home heat consumes a great portion of your energy bill, it’s payback can be under 5 years. Solar Space Heating uses the solar evacuate tube collectors to capture the sun's energy, this energy is then transferred to a storage tank or concrete pad (in floor heating). The stored heat is then integrated with the existing heat system to supplement the heat supply. Larger 119 gallon storage tanks can hold more energy and as such can be used in the evening to supply heat when the sun is not shinning. Because the heat demand occurs during the winter, a secondary dissipation loop may be needed to off load the heat in the summer months. If a customer has a pool or hot tub, the excess heat energy can be transferred in the summer giving the customer free pool or hot tub heat and space heat in the winter. Alternative a dissipation loop such as buried pipe or exterior fan can be used to dump the heat. A geothermal system is also ideal way to remove the excess heat in the summer storing it in the ground for the winter! Note: alternatively one can cover or unplug the heat pipes in the summer as a manual means of shutting down the system. Because solar home heating or space heating system are used in colder regions they are susceptible to freezing, a special solar glycol heating fluid is used to avoid damage that would be caused by frozen pipes. This special fluid can operate at -40 F but can also operate in temperatures as high as 480 F.
We use Specialized Solar Storage Tanks that have a larger 119 gallons of storage capacity capable of holding over 120,000 BTU (35 Kw) of heat energy at any time. Northern Lights Solar Home Heating Systems use a special solar storage tank. This storage tank system allows for solar storage during the day and can release the stored energy at night when the demand is usually higher. The storage tank also is used as the domestic hot water tank so that the solar can provide both solar water heating and space heating in one system. Our Solar Heating System comes with a 4.5 Kw element located in the middle of the tank. It is optional whether a customer uses this or not. The element can be used to ensure there is always hot water even in the evenings. 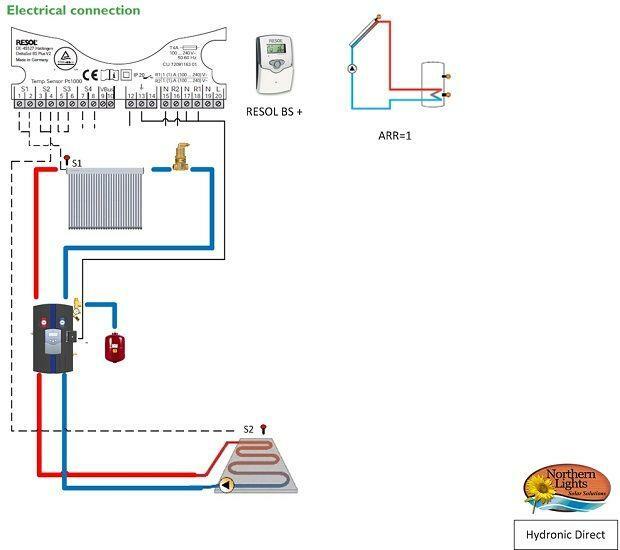 This Hybrid system is especially popular for Solar Radiant Floor Heat, because the solar space heating system can replace the need for a Hydronic boiler as the 4.5 Kw heater and the solar energy should provide enough energy or up to about 2,000 square feet of solar heating space. 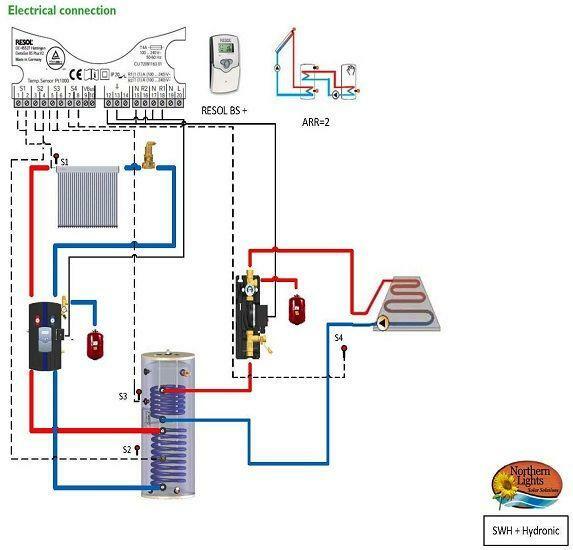 The Resol controller is capable of controlling both the solar heating loop plus the 2nd heating loop. This type of integrated solar heating package has the highest solar heating paybacks! Solar Home Heating combined with Geothermal heating is another very popular means of combining two Green energy sources to provide a Maximum Cost Savings. By using any excess heat from the solar water heater we can add this energy to the geothermal loop by means of a heat exchanger. Click here for more information on solar heating & geothermal. Solar Water + Space Heating + Pool – WIN,WIN,WIN! If you are fortunate enough to own a pool, you know that when living in Northern USA or Canada the season is much to short! Using solar to heat your pool in the summer and shoulder months and then heat your home in the winter months is perhaps the most ideal system and the best way to provide free energy 365 days a year. Oh Yah and did we forget to mention FREE domestic hot water! This system solve the problem of too much heat in the summer. Most pool owners welcome any heat and especially if it is free!